Cannot open backup device ‘%ls’. Operating system error %ls. Same message is applicable for restore as well, it’s all about unable to open device. If we notice %ls is placeholder which would be inserted when message is raised. Some sample errors are as below. Cannot open backup device ‘E:\Backup\SQLServerHelp.bak’. Operating system error 3(The system cannot find the path specified.). Cause: Backup folder not created on E Drive. Cannot open backup device ‘C:\SQLServerHelp.bak’. Operating system error 5(Access is denied.). Cause: SQL Server Service account is not having permission on root of C Drive. Cannot open backup device ‘\\NetworkShare\Backup\SQLServerHelp.BAK’. Operating system error 53(error not found). This one is interesting because it doesn’t tell the exact message for OS error 53. Sometime this could happen with any other OS error as well. Refer my earlier post here where I showed how to get text for an operating system error number. 53 = The network path was not found. Cause: Network Path: \\NetworkShare\Backup was incorrect. OK. Let me stop here.. I didn’t plan to discuss all the possible errors but this blog is to present one interesting scenario which helped me uncovering an operating system concept. Let’s create a database using below script. Once database is created I have created maintenance plan to take full backup of the database. Execution failed. 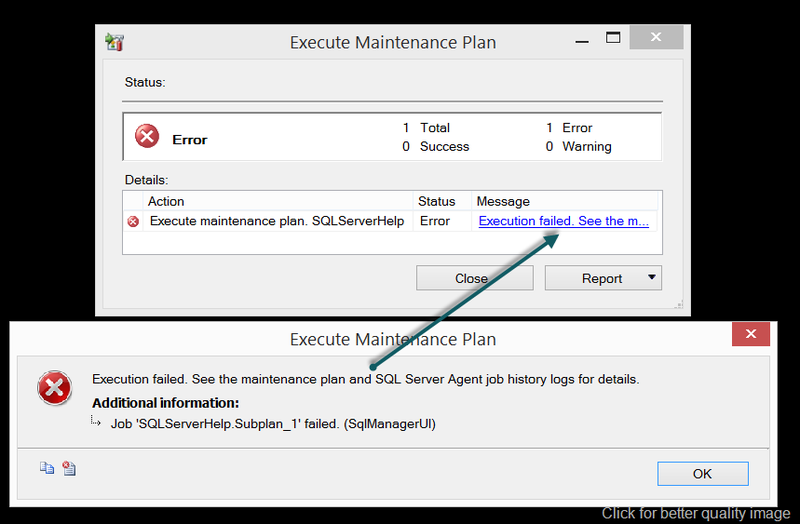 See the maintenance plan and SQL Server Agent job history logs for details. 2014-03-13 06:20:31.66 spid65 Error: 18204, Severity: 16, State: 1. 2014-03-13 06:20:31.66 spid65 BackupDiskFile::CreateMedia: Backup device ‘E:\Program Files\Microsoft SQL Server\MSSQL11.MSSQLSERVER\MSSQL\Backup\SQL Server Help \SQL Server Help _backup_2014_03_13_062031_6415729.bak’ failed to create. Operating system error 3(The system cannot find the path specified.). 2014-03-13 06:20:31.66 Backup Error: 3041, Severity: 16, State: 1. 2014-03-13 06:20:31.66 Backup BACKUP failed to complete the command BACKUP DATABASE SQL Server Help . Check the backup application log for detailed messages. when I looked at folder structure, I found that there is a folder “SQL Server Help” got created under “E:\Program Files\Microsoft SQL Server\MSSQL11.MSSQLSERVER\MSSQL\Backup” but still backup was failing. I ran profiler to see the command being fired. When I executed the command, it failed with below error. 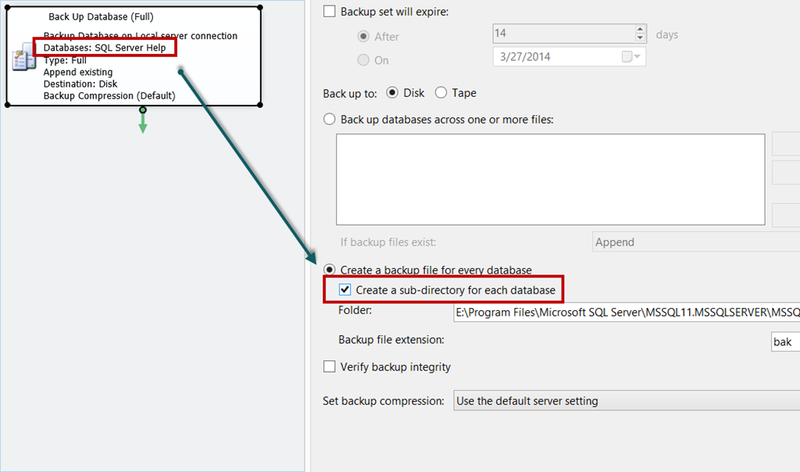 Cannot open backup device ‘E:\Program Files\Microsoft SQL Server\MSSQL11.MSSQLSERVER\MSSQL\Backup\SQL Server Help \SQL Server Help _backup_2014_03_13_062920_6305771.bak’. Operating system error 3(The system cannot find the path specified.). The root cause of my problem was name of the database where I have added an space at the end intentionally. Go back and have a look at create database statement which I have used. I also participated in this discussion where same problem was posted long back. Hope you have learned something new! This entry was posted on March 13, 2014 at 3:30 AM	and is filed under Error, SQL Server. Tagged: backup, cannot open backup device, Error: 3201, failure, Level 16, Line 1", maintenance plan, Msg 3201, SQL, State 1. You can follow any responses to this entry through the RSS 2.0 feed. You can leave a response, or trackback from your own site. Wonderful post but I waas wondering if you could write a litte more on this subject? I’d be very thankful if you could elaborate a little bit further. Thanks! Alert description: BackupDiskFile::CreateMedia: Backup device ‘L:\PSC01\BACKUP\recorder.bak’ failed to create. Operating system error 3(The system cannot find the path specified.). After like every couple of days the alerts are coming and there closure also. The above drive mentioned in the alert is already got removed from the server around a month back and don’t know how we are receiving the closure also and also we didn’t found anything from our end, because we have a separate backup job which is running successfully everyday. I have worked on similar issue and default trace helped in finding source of backup command. It was identified that there was some third party backup running on different server sending backup command to this server. Are you seeing backup failure on specific times. Another reason you might receive the error “Cannot open backup device ‘…’. Operating system error 3 (The system cannot find the path specified. ).” is because you might have created the backup directory on your local machine. Because the backup facility is relative to the physical server upon which SQL Server installed, you will meed to go to your SQL Server node and create your directory structure there. Extremely helpful information specially the final phase 🙂 I maintain such info much. I used to be seeking this certain information for a very long time. Thank you and good luck.